Musician and composer William Christopher “W.C.” Handy was born on November 16, 1873, in Florence, Alabama. Widely known as the “Father of the Blues,” Handy is recognized as one of the leaders in popularizing blues music. Young Handy’s interest in music was discouraged by his family and his church. He once saved his money and purchased a guitar which his father, Charles Bernard Handy, a pastor, made him return in exchange for a dictionary. Handy joined a band as a teenager and purchased a cornet which he kept secret from his parents. Despite having little formal training, W.C. Handy was exceptionally bright and in 1892 at the age of 19 he traveled to Birmingham to take a State teaching exam. He passed with ease and briefly became a schoolteacher. Handy soon realized, however, that teaching was a poor-paying profession and quit to pursue a career in music. In 1896, at the age of 23, Handy became bandmaster for “Mahara’s Minstrels.” He chose this group despite the low regard many educated African Americans had for these shows. Handy toured with this group for three years, traveling a circuit that crisscrossed the South but which also took him as far as Chicago and Havana, Cuba. Handy met his soon-to-be wife Elizabeth Price while performing at a barbecue near Henderson, Kentucky in 1896. Earning a living on the road proved difficult, however, and in 1909 Handy settled in Memphis. There he organized a band that performed on Beale Street. It was here that Handy wrote his first song “Mr. Crump,” as a campaign tune for mayoral candidate and later political boss E.H. Crump. The song, which Handy renamed “Memphis Blues,” became nationally popular. In 1912, “Memphis Blues” made history when it became the first commercially published blues song. W.C. Handy started Handy Brothers Music Company and produced his next hit song, “St. Louis Blues.” Other successful songs followed, including “Yellow Dog Blues” in 1914 and “Beale Street Blues,” in 1916. In 1918 Handy moved his business to New York where he realized continued success when he wrote “Aunt Hagar’s Blues.” He worked steadily through the 1920s and 1930s promoting blues to mainstream audiences. In 1928 Handy became the first artist to perform the blues in New York City’s Carnegie Hall. One year later his “St. Louis Blues” became the basis for a Hollywood movie by the same name. Handy continued to write and publish music. 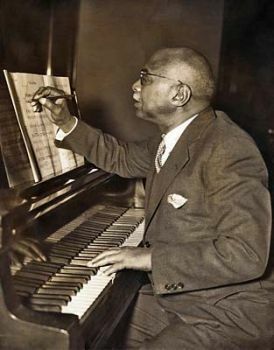 He also wrote five books on the blues, black folk music, and early African American composers. By the 1940s Handy was wealthy and living on Striver’s Row in Harlem. An accidental fall in 1943 from a subway platform caused his blindness and ended his music and book writing career. William Christopher Handy died from pneumonia on March 29, 1958. His hometown, Florence, Alabama, hosts a music festival every year in his honor. His original house is now a museum and tourist attraction.